“No one is holding me in my house as a hostage” says Health & Fitness Guru Richard Simmons: Fans & Friends worry as he remains secluded. This past weekend an article surfaced in the “New York Daily News” about fitness icon Richard Simmons. Yes, we used the term icon. I mean, who else was loved by your Grandma, Mom, and middle-aged women of the 80’s more than Richard Simmons?! His “Sweatin with the Oldies” franchise and flamboyant, jazz-hands and tip toes personality made him a beloved public figure. Throughout the interview, Simmons reassured Guthrie that he’s got bad knees, he’s wanted to take time, he’s got a gym, he’s got everything he needs and he told fans he would be back. Simmons sounded good but really he seemed more annoyed by all the fuss. Fans may be satisfied with The Today Show interview and let the matter go. Others may have just now found out what’s going on. This whole Richard Simmons story reminds us at ShowbizSpy of the Rogelio de la Vega (@jaimecamil) story line on “Jane the Virgin” (@JaneWriters). On the show, telenovela star, Rogelio de la Vega (Jane’s dad) is held hostage by his assistant/stalker. She posts to social media on his behalf and responds to texts from his daughter so no one will become suspicious. Could art be imitating life? Could Richard Simmons’ life turned into its own Telenovela?! Could an ex-assistant and masseuse just be former employee scorned? Could Oliveria just be doing this for (gasp! ), publicity?! Have we been watching too much TV?! Maybe so, but wait, the plot thickens! On Monday, Access Hollywood, spoke to Oliveria, whose claims were quoted in the news piece. They discovered that Oliveria may have an alternative motive (surprise!). 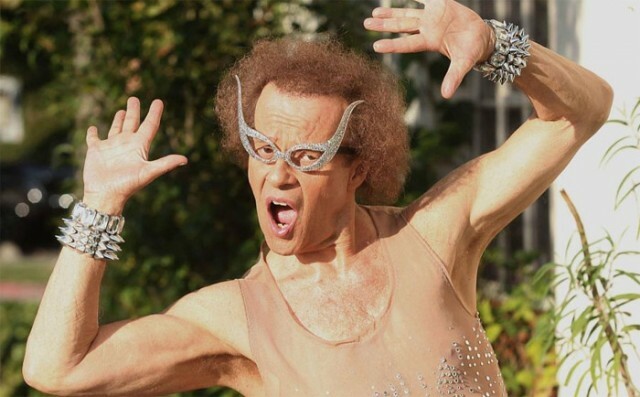 He may be using this to publicize his new book based on (wait for it…)Richard Simmons and his housekeeper! The self-published book titled, “King Rich & The Evil Witch” is described as “A Living Fairy Tale by Mauro Oliveira.” When asked about the book Oliveria responded, “I wrote the book a year ago, over a year ago, and I actually am not doing this to promote the book. The book is just a consequence of this. The book is about the truth.” All this new information would lead one to believe that maybe Simmons was not being a recluse; maybe he actually cut Oliveira out of his circle. Previous articleRIHANNA 2016 ANTI WORLD TOUR JACKSONVILLE OPENING NIGHT: SHE KILLED IT! Next articleCONFIRMED: INDIANA JONES 5 WITH HARRISON FORD IS A GO SAYS DISNEY!